Since I requested to have my birthday off this week, I ended up having nine days of work in a row starting Tuesday last week and ending the day before Valentines Day. Not gonna lie, it was a little brutal at some points. After the first three or four days though it ended up becoming a routine to just get up, get dressed in my costume, and walk to the bus stop to work without really thinking twice about it. Near the last few days guests started to notice that I had been working every day without a day off, and some of them actually sounded concerned for me (one asked if I was an animated character because I seem to never leave the restaurant). All of the guests that recognized me were really nice, and one actually happened to grow up in the same town as my mom! He even knew where I was from! (Which is rare, since people don't usually know Northern California above Sacramento.) A lot of people are starting to ask where my college is from, which leads to why I'm working all the way over in Florida and explaining what the DCP is. It's fun telling people about my adventure and this opportunity that not very many people actually know about. The man turned to me and kept saying, "Call security." He wouldn't respond two these southerners' words, all he kept telling me to do was call security. I picked up the phone and tried to find the number, but there wasn't one. My coworker in the register in front of me called my manager and then I managed to get the line going again before anything serious happened. Not gonna lie, I started freaking out a little on the inside. I've never had a situation like that...two guests yelling at each other almost starting a fight right in front of me. Luckily nothing happened and my manager talked to the couple once she arrived and heard about the situation (the random man had left already). Earlier that morning another rather eventful situation happened while I was on cashier. A little girl walked up to me and asked if I remembered my customers. I asked why and she asked if I remembered a woman with her mom's name (I forget what it was). I immediately got worried and asked her if she was lost. She nodded her head and I noticed her eyes were swelled from crying. I told my coworker in front of me that I had a lost child and I needed to take care of it, so someone hopped on my register while I took the young girl to the front desk. Luckily the little girl had her mom's cell phone number memorized, so the front desk coordinator kept calling until she finally picked up. She happened to be on the patio at my restaurant in an area the little girl couldn't see. The coordinator told the mom that I would meet her at the pool outside to make sure her daughter gets back to her safely. On the way to the pool, I talked to the little girl and she said she was in town for her cousin who was participating in the cheerleading competition that was going on at Hollywood Studios that weekend. She asked me where I was from and why I wasn't living in California right now, and I told her I came here to work. She asked if I could go into the parks whenever I wanted, and I said yes, and she said she was jealous (who wouldn't be?). As soon as we got to the pool we found her mom waving and running to hug her daughter. She thanked me and I left as soon as I knew the situation was safe. I went back to my work location and told my coworkers the girl had found her mom. I was definitely relieved. One thing about my work location that I kind of wish would change...my restaurant doesn't really do anything for magic moments for guests. I was told they used to give away free cupcakes with lit candles to celebrate guests' birthdays, but as soon as they changed the cupcakes to gourmet they couldn't give them out for free so they stopped. Sara's location has stickers and crazy straws that they give guests to make their experience a little more special. Just this past week, I was on cashier and I found a bunch of Mickey stickers hiding behind the cash register! I put a few in my pocket, and became more aware of possible situations to give them to people. Otherwise, most of those nine days consisted of working hard and making sure I survived without being totally sleep deprived and/or exhausted. The first day I had off I went to Animal Kingdom and Hollywood Studios with my grandparents, and it was unfortunately cold and pouring rain for the first time since I've moved here. I'll talk about this trip more in another post probably since we did quite a bit during that day. I also celebrated my birthday in Magic Kingdom on Friday, which like I said before I'll make a video blog about the whole experience since there'd be way too much to type! Oh, about the face character audition, I wasn't chosen, and neither were any of my roommates or friends. It was a really short process after waiting in line for nearly two hours, and nearly 700 girls went to audition. They took us in rounds of 50 and took only five people at most per group, and they took none out of mine. It's all good though! I was wondering, what would you guys like me to share with you? What do you want to know about that I haven't talked about yet? 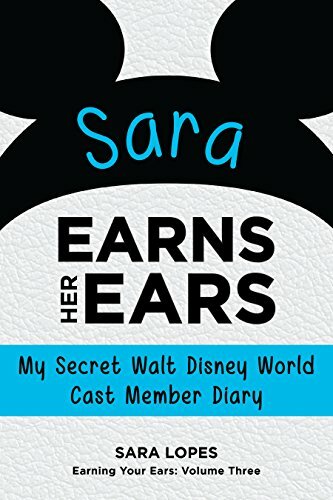 I know some of you asked about Sara and how she's doing at the Wilderness Lodge, but that requires her sitting down and telling me what to write for you or having her write it haha. I'll probably just have a video blog and have her explain how she likes it on there, since it'll be easier for her that way. We'll see! Still, let me know what you want to hear! This coming week I'm being deployed (temporarily moved) to Gasparilla Grill in the Grand Floridian, which is such a fancy hotel! I'm pretty excited to try something new outside of my resort, even though I love the Polynesian. I'll let you know how it goes! Enjoying reading your blog. I came across it while reading stuff about Disney. I think it was the Disney Discussion Board or pinterest. We are going for our honeymoon in 12 days so I've been reading everything I can about Disney World. I think it is so cool that you are creating the magic! Its like a cycle of magical moments! Please keep blogging and vlogging! I love to learn more about this program through people who really love Disney and and the magically moments it provides. Can you talk about the class you said you were going to take? Thanks so much! I'll definitely inform you guys about the two classes I'm taking! I just recently started actually taking them last week, so they're still in the beginning stages with not much to talk about. But I will let you know more once they develop!